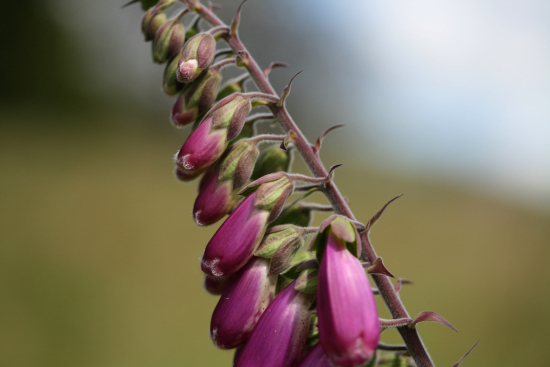 Here is another yoke — this one’s name is self-explanatory — Foxglove. One of the things I’ve really enjoyed about my first year of rural living has been the wildflowers that grow around my home. Just a few yards from my front door are a wide variety of environments from heathland, bog and lochside to deciduous woodland and roadside hedgerows. Walking through this landscape every day, I have found it fascinating to observe the wildflowers emerging, coming into bloom, taking over the landscape, and falling away to seed. Back in the spring, I began keeping a record of the wildflowers I spotted on my daily walks (mostly within a 4 mile radius of my home) by recording a photograph on Instagram. (If you are interested, you can find that series of pictures under the hashtag #todayswildflower). I found that the simple act of taking a photograph of a plant, and later looking it up in my reference guides meant that, by the end of the summer, I had learned a reasonable amount about local wildflower habitats, the time of their flowering, their relationship to other plant varieties and so on. I discovered some wonderful plants I’d never seen or noticed before – grass of Parnassus, scarlet pimpernell, butterwort. 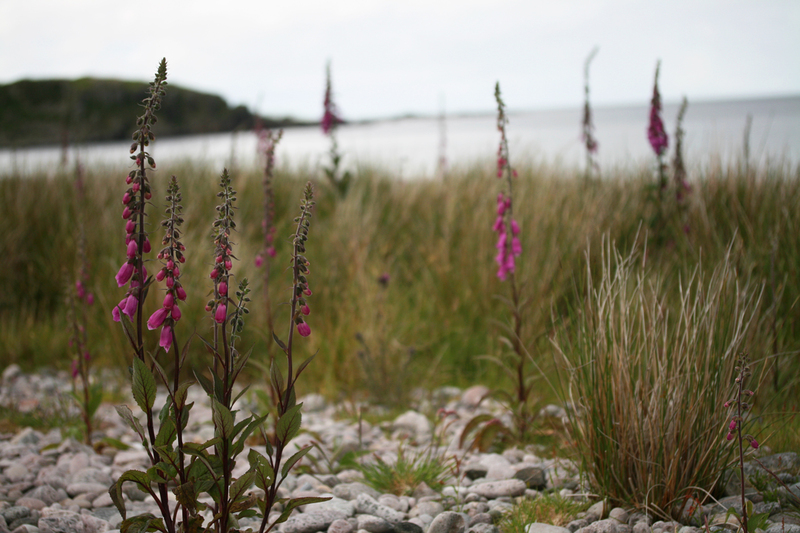 I also learned to look anew at flowers I thought I knew reasonably well – such as foxgloves. I love their pink spires, their sheeny blooms, their downy leaves, their beautiful variegated interiors, the surprising deep beetroot purple of their stems. 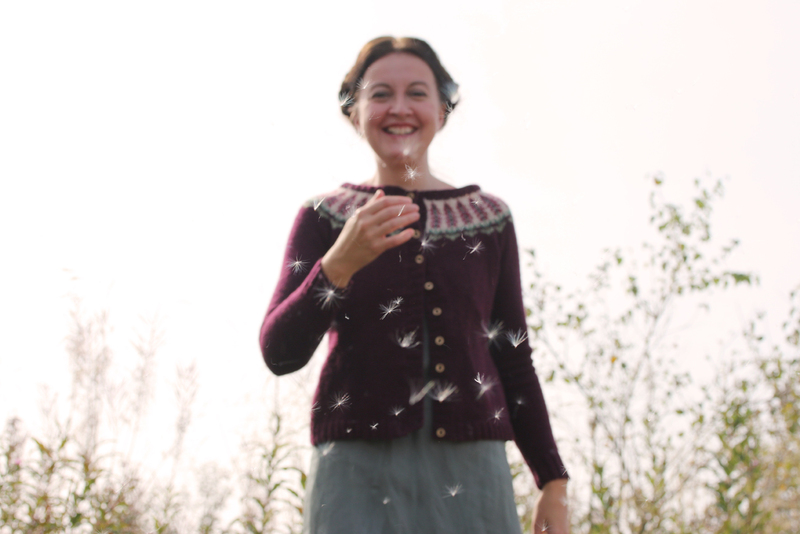 I knew I wanted to knit the foxgloves up into a yoke, and really enjoyed developing my chart for this design. 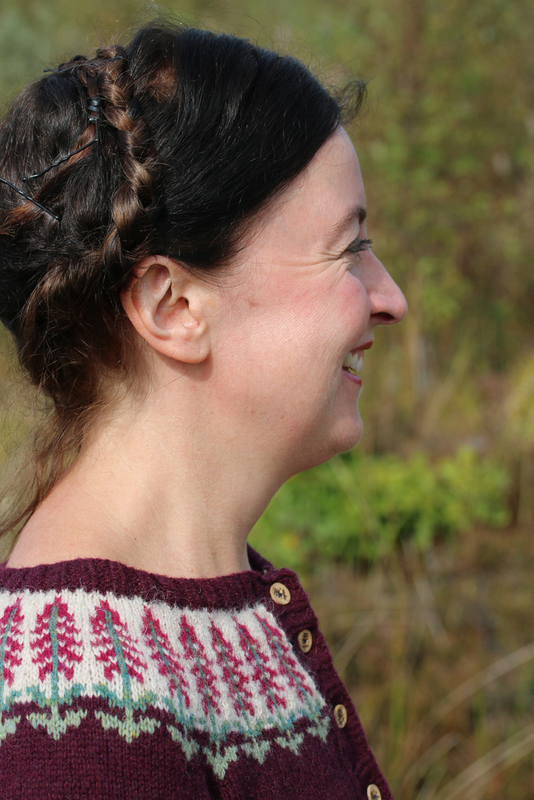 Foxglove is the only design in the collection to use three colours in one row. (I have a neat trick for this, borrowed from Elizabeth Zimmermann, which the pattern describes in full). 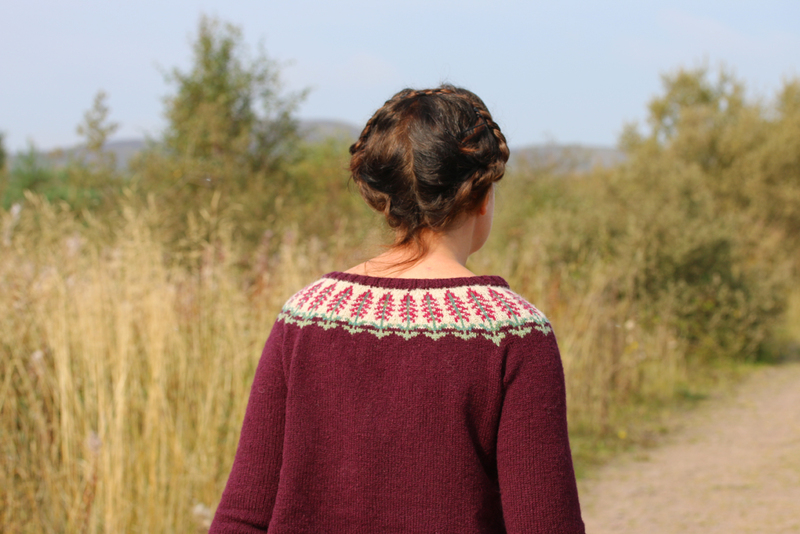 This yoke is in the Shetland style. It is knit in the round and steeked; the garment has some shaping after the arms are joined, and the yoke pattern itself is relatively shallow, and placed high up on the neck. That said, in my experience the necklines of many Shetland yokes have a tendency to ride rather too high – this one shouldn’t, and is intended to sit quite neatly at the throat. As you can see, by the time I’d actually managed to knit my sample, summer was turning into autumn, and it was no longer foxglove season. 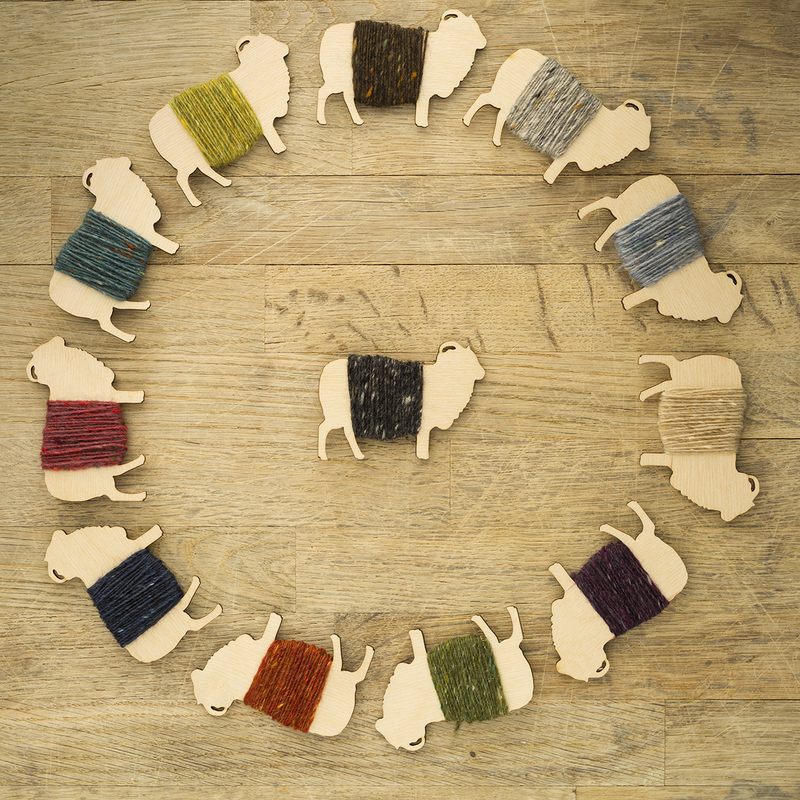 The yarn I’ve used is, of course, Jamieson and Smith jumperweight – the perfect yarn for a Shetland-style yoke. 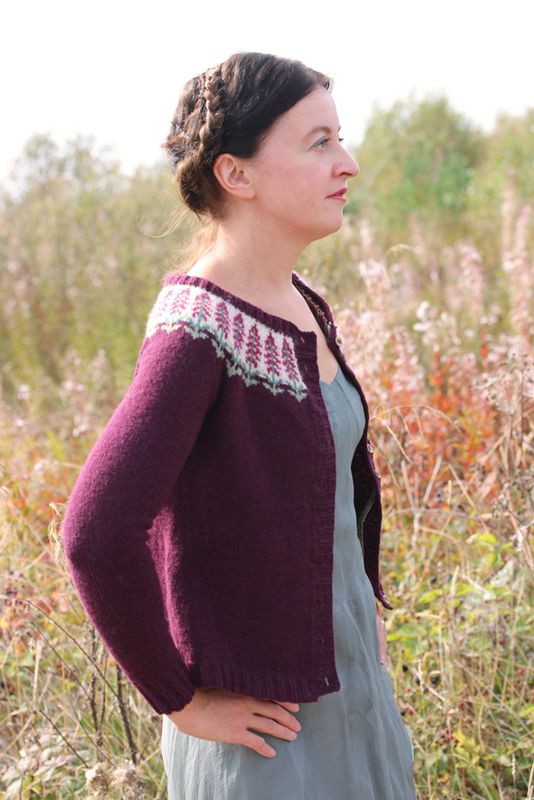 I have another yoke in this collection which was also inspired by a Scottish wildflower. More about that one tomorrow. Gorgeous and I love your dress. A perfect match! Such a RICH coloured sweater. You got the flowers just right and of course it is lovely with that dress! You look so happy here! Just radiant! And the dress looks like it came from fairy tale. I love burgundy colour of your yoke. Simply, GORGEOUS! 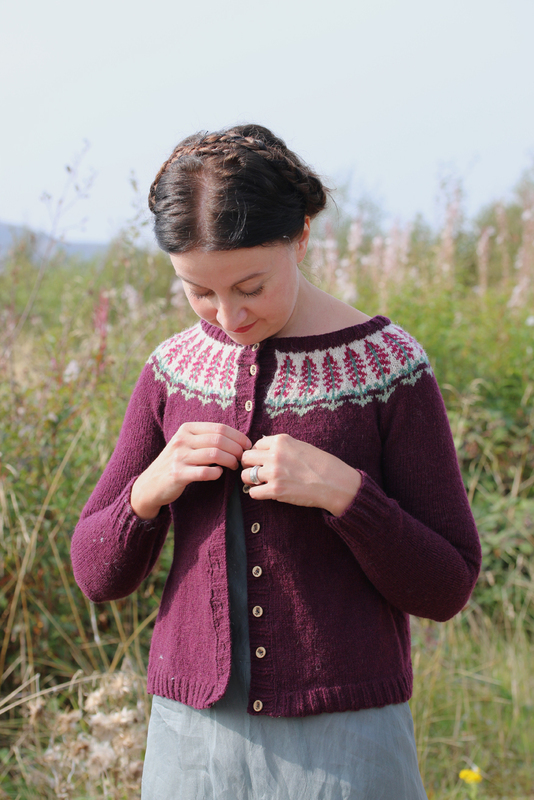 I can’t wait to knit this one–it is lovely. Dang! This border is the most lovely so far. I am making this sweater first. 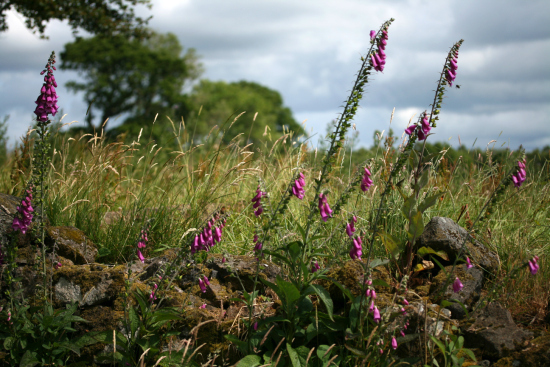 Beautiful carigan – love the colours and beautiful foxgloves. I let these seed all over my garden and they never fail to cheer me up, with the bright pink blooms, which go on for months. Really looking forward to my copy of your book arriving. 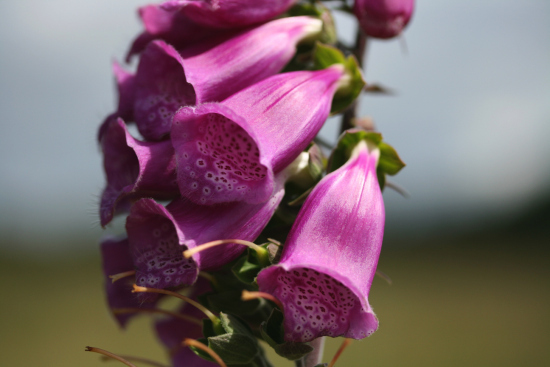 I love a foxgloves, my mum has many this flowers in her garden, and I LOVE Your cardigan! Wonderful! Foxes Sockes we used to call them when I was a child in England. now I have them growing here in my northern California garden. And Oh Yes, The Dress , just perfect. What a lovely rich color. The design looks exactly like the flower! I recently visited my first whiskey bar. My husband laughed at me because I kept referencing the whiskey and it’s regions to a sweater design of yours. I especially liked the Islay,coastal, Peaty whiskey. 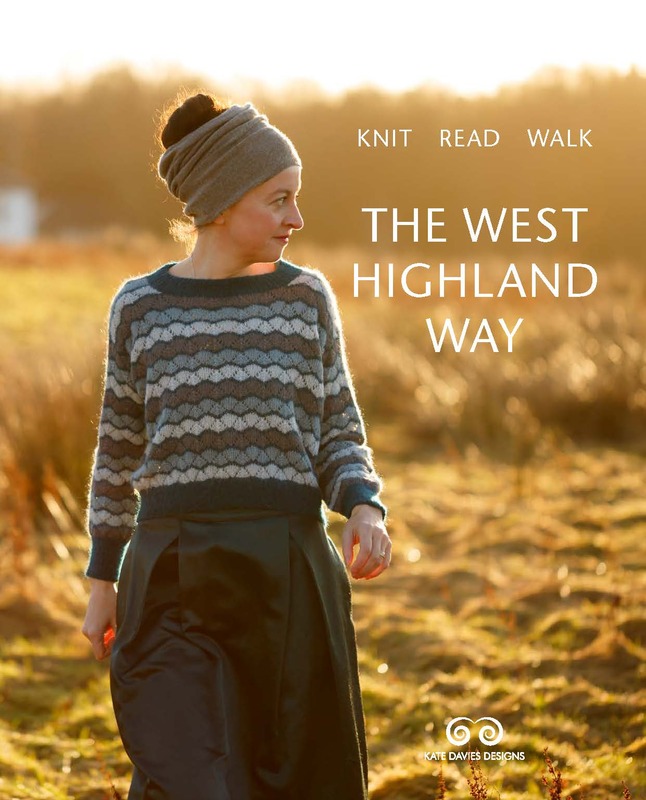 I wonder what sort of yoke design would nod to the various sorts of whiskey in the Scottish Isles? Not that you would want the image of Johnny Walker around your neck, but have you ever thought of combining the two in a tasteful (pardon the pun) design? Regardless, it’s a real joy to wake up to another yoke. This is so beautiful!! I would wear it constantly. As we all look forward to your email everyday, I believe I speak for everyone who has pre-ordered your book when I say the wait is killing me… I can’t wait to get my hands on it! I admire you and your talents so much Kate! It is so inspiring to see your gorgeous photos, and I just have to say, your dress is fabulous! I love how you style the sweaters with such great clothing! Cheers! 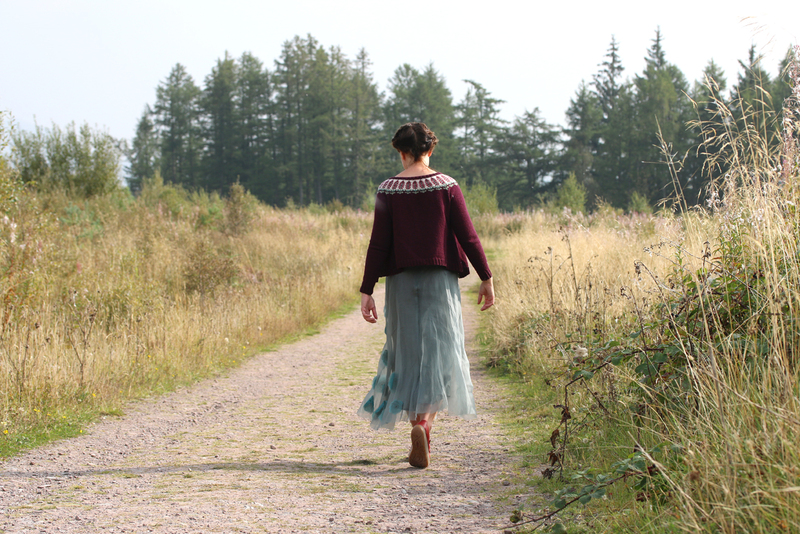 Beautiful cardi and dress! 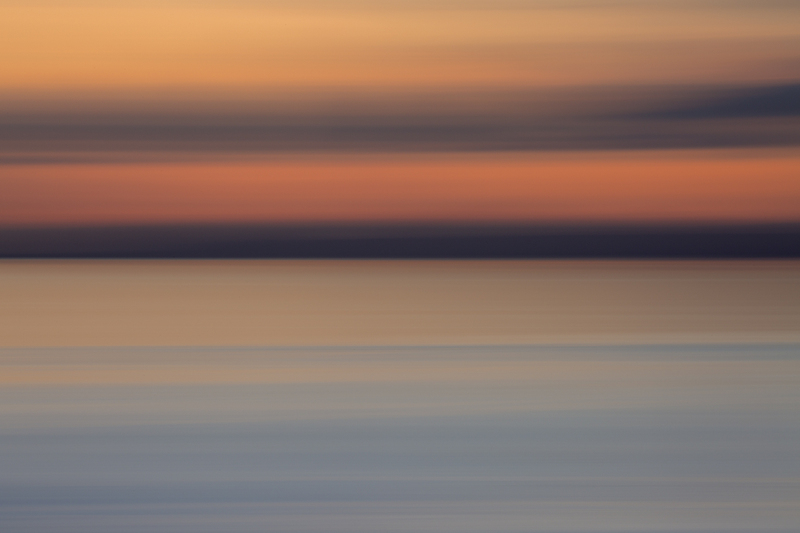 Simply enchanting! Cannot wait to receive my book! Love them all, but this my favorite so far. I too love foxglove. Beautiful and just love the dress too! Dear Kate! You make my (knitter’s) world so much better with your beautiful designs. I am very much enchanted with the picture of you among flying dandelion seed. Everybody should look so happy from time to time. Thank you. What a beautiful way to hold onto fair weather the year round. I am so looking forward to receiving my copy of the new book …. this is another sweater that I’ll be making from it. Thank you, Kate. Oh, Kate! This may be the prettiest one so far; and you are so lovely modeling, with your happy smile! I am enchanted with these photos! Thank you for sharing! Nice! But the star of the post was your smile! Please tell me about the dress. Did you make that too? Thanks so much. Another lovely design! Can’t wait to get my book!! !